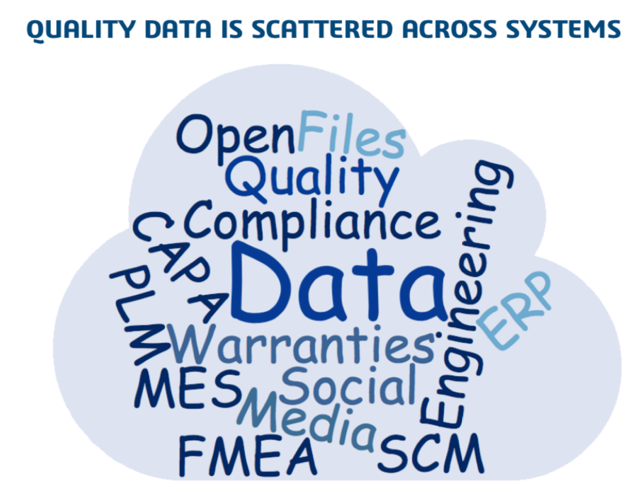 Quality-related data lives in many diverse systems. 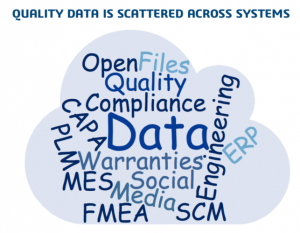 It can be found, of course, in dedicated quality and compliance systems (which too often track only limited, easily quantifiable costs like scrap, rework and warranty claims). But important quality information can also be found in broader design, engineering and manufacturing systems such as design files, production databases, field engineer notebooks and supplier spreadsheets. It can also be found in machine log data, customer relationship management (CRM) databases, social media posts and commentary, and many other sources. Given this diversity, knowing where pertinent quality data lives, and achieving a unified view of it across systems, are formidable challenges. Currently, most quality control strategies rely on a single quality database or data aggregated from only a few select sources. This leaves important quality data isolated within discrete organizational units and information systems. And the situation is even worse for analytics. Quality-related analytics in turn run on inherited data, by teams with different responsibilities working in different locations around the globe. For example, analyses of pre-production test results may be stored in a quality control database, while analyses of sensor logs from in-use products may remain in a service partner’s spreadsheets, and analyses of customer feedback may remain isolated in a distributor’s CRM system.